The ClareVue Lighting Virtual Keypad is a virtual keypad. It does not have a physical connection to any wiring or devices. Each project in Clare Controls can have an unlimited number of virtual keypads. Each virtual keypad has up to 16 configurable buttons. By integrating the ClareVue Virtual Keypad into the ClareHome control system, your customers can control the associated lights or scenes from their Android or iOS devices. 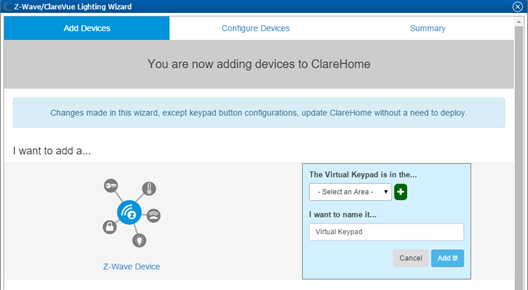 Add and configure the virtual keypad using the ClareHome and Install Assist apps. 1. Access the Clare Controls Install Assist app, and then tap Add Devices. Access the ClareHome Mega Menu, and then tap Add/Edit Devices. 2. At the bottom of the screen, tap the plus icon. 6. Enter a name for the keypad, and then select an area. 7. Tap outside of the area drop-down, and then configure they keypad buttons. 2. Enter a name for the button, and then tap Add Configuration. 3. Select the desired devices and actions to for the first button. 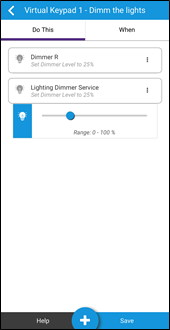 In the example below, two dimmers are set to 25 percent. 5. 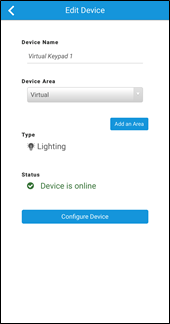 Tap Configure Device > Add Button, and then repeat steps 2 through 4 for each desired additional button. 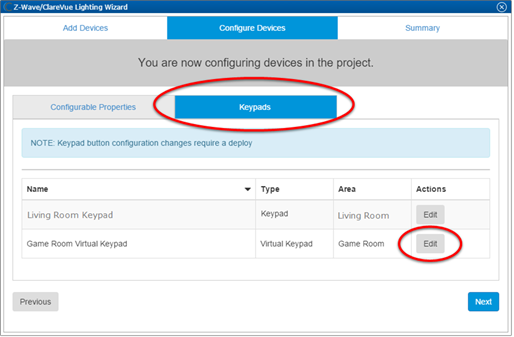 Add and configure the virtual keypad using Fusion. 1. 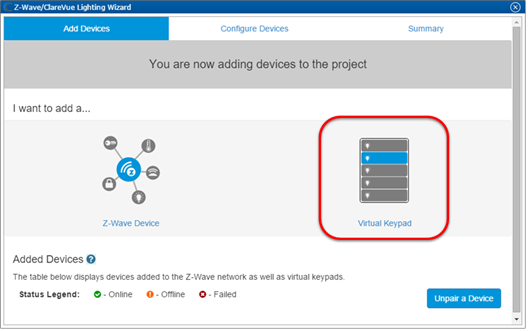 Access your project, and then click the Z-Wave Wizard icon. 2. The Clare Controls Z-Wave Wizard displays. Click on Virtual Keypad. 3. Select the keypad location, and then enter a name for the virtual keypad. Note: If you want to add an area, click the green plus icon, enter a name for the area, and then click Add Area. 4. Click Add It!, and then click the Configure Devices tab. 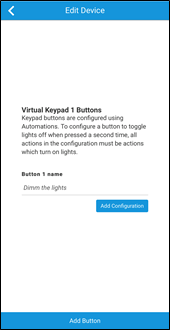 5.Click the Keypads sub-tab, and then click Edit to configure the added virtual keypad. 6. After configuring the keypad, click Next to view the Summary tab. 7. Click the Keypads sub-tab to verify that the keypad saved successfully. Note: You can edit the keypad from this sub-tab. 8. Click the Close Window icon in the top-right of the wizard to exit and return to the project’s Devices tab. Make sure to deploy the project. The keypad has three modes with two feedback options. The mode selected dictates the behavior of the LED indicator on the keypad buttons and on the User Interface of the keypad. Lighting scene and momentary scene share one LED behavior, and toggle has its own. There are 3 keypad types; toggle, lighting scene, and momentary scene. 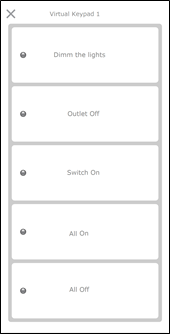 Toggle: The devices toggle on and off. Once a toggle button is pressed, that button’s LED remains on until the button is tapped again. The LED is the state of the button, not the devices attached to the button. Once the button is pressed a second time, the LED extinguishes. Lighting scene: The lighting devices enter a preset (this is set in the ClareVue Lighting Wizard) state. A lighting scene button’s LEDs turns on for a brief time as the scene is initiated and extinguishes. This is the same for a momentary scene keypad. A Momentary Scene is running: Scene keypads allow you to attach scenes to buttons on the keypad. This type of keypad allows devices other than lighting to be used with your keypads. A lighting scene button’s LEDs turns on for a brief time as the scene is initiated and extinguishes. This is the same for a momentary scene keypad. 1. Click the Edit button next to the keypad. 2. Click Select the desired LED feedback behavior mode (Toggled On or In a Lighting Scene) from the drop-down. Caution: If you start to configure the keypad buttons, and then switch the type of keypad you are using, all of the button configuration is erased. You must reconfigure all buttons on the keypad. 3. After selecting the keypad type, click the button on the keypad. Select the text box to enter a name for the button. All devices the button can control are visible. 4. Click the desired Configured Action button for each device you want associated with the keypad button. 5. 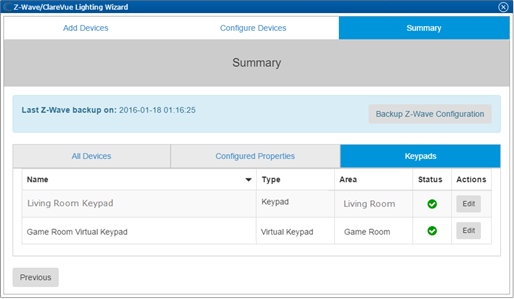 Click Save Button Config after configuring each individual button. Note: If button configuration is not saved after each button, the buttons will not retain their set configuration. 6. Repeat steps 3 through 5 for each button, and then click Next to view the Summary tab. 1. Find the keypad that you wish to configure, and then click Edit in the Actions column. The keypad mode selection drop-down appears. Note: Scenes must be created before attaching them to keypad buttons. 2. Select In a Momentary Scene from the keypad mode drop-down. 3. Click a button on the keypad to configure. 4. Select a scene from the Select a Scene drop-down. Note: Once a scene is selected, the selection is automatically saved. 5. Repeat steps 3 and 4 for each keypad button. 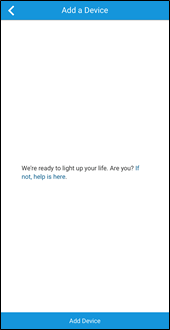 Once deployed, the user can add the device to their space, and then tap the lighting icon in the ClareHome app to display and operate the devices or scenes associated with each keypad button, as shown below.